In ancient times, hammams, or Arab baths, were functional personal hygiene measures that doubled as social establishments (think country clubs) and while many can still be found throughout the Middle East, it came as a pleasant surprise that they're also pervasive in southern Spain. Years ago I missed the opportunity to visit a hammam in Turkey and I knew I couldn’t make the same mistake in Granada, a city whose Moorish influence is strong. I had an appointment at El Aljibe San Miguel and was looking forward to a day of relaxation following my previous long day of touring the alhambra. I entered the dimly lit greeting area with trepidation, “Ummmm hi, I’m here for the noon appointment?” I stumbled over my words in Spanish. “Ah, Liz, Bienvenido.” Juan Perez greeted me warmly. He confirmed my package (access to the baths and a massage) and handed me a towel and a bracelet with a number that would be used for my massage. He pointed me in the direction of the locker room where I changed into my bathing suit and thought, “Crap, now what?” I poked my head out, saw the large Arab door to my left and figured that must be the entrance. I tip toed up to it (it was so quiet!) and nudged it open to reveal a room full of different size and style tubs all lit in different dusky hues. I hung up my towel and did a quick walk around the hammam, dipping my toes in as I went. I’d read that typically the hammams follow some sort of pool progression -- usually from warm to hot to cold. It seemed that the pools were all about the same temperature except for the ornate and beautifully lit pool in the room’s center, which was cold. I knew I wouldn’t be starting there, but that left me with six other options. I nervously eyed a few and choose the mid-depth vessel in the far corner. I sat down and let the warm water wash over me. I can’t remember the last time I was in a hot tub and the last bath I took was unfortunately shallowly filled with boiling pots of water because our hot water heater had gone out (again), so needless to say, this was really nice. I closed my eyes and when I opened them again, I realized that a few others had joined me in neighboring pools. As they chatted to each other in hushed voices, I went to explore a new pool. I settled into the shallowest of the seven, which I realized was slightly warmer than the first. I laid back and instantly knew that this tub would work well for me. I comfortably rested my head on the submerged ledge surrounding the pool’s perimeter and in doing so, I could keep my face above the water, my feet on the ground, and my body floating in the middle. With my head partially submerged, all I could hear was the sound of my breathing and the faint trickle of the water pouring into the center pool. Bliss. When it came time for my massage (I was 6th in line according to my bracelet), I grabbed my towel and headed into the darkened corner cabana. I had a 15 minute session, which it seemed was the package of choice, and though it was brief by my American standards, it was the perfect way to wind down my time at the baths. Once it wrapped up, I took my time enjoying a final few dips, and helped myself to the surprisingly refreshing sweet mint tea that had been left out for us. I took a few moments to stop in the cool center pool and made my way back to the locker room. As I finished my visit at the hammam, walking out onto the street I assumed I would feel like a vampire emerging from a cave into the light of day. And I expected to need to rush to the nearest coffee shop for a café solo (or 3). Regarding this, I was pleasantly surprised. I grabbed a bocadillo nearby feeling invigorating and energized. No coffee needed for me! 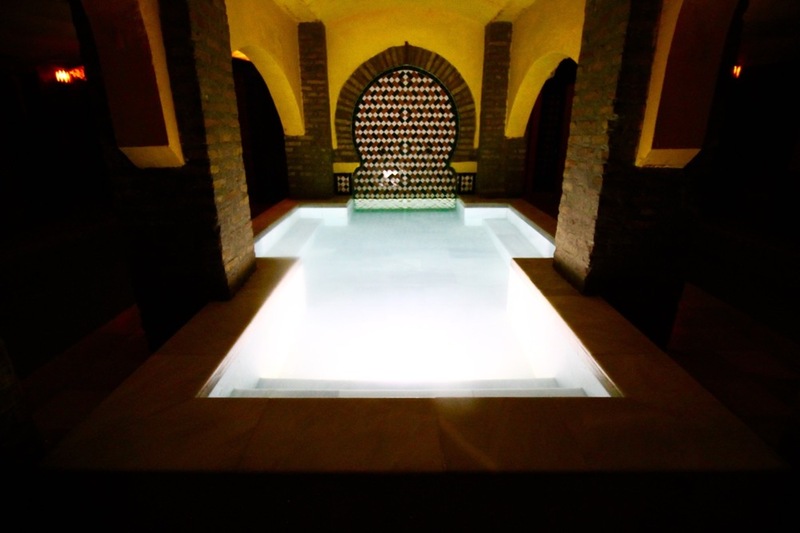 Have you visited a hammam? Though this was my first experience, I hardly expect it to be my last, so let me know where your favorite experiences have been! P.S. I visited El Aljibe San Miguel as their guest (thanks!). 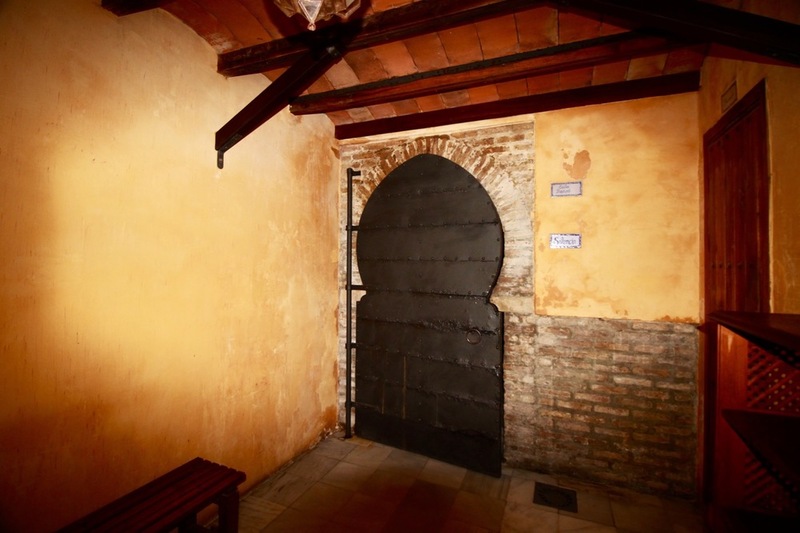 If you would like to book your own visit while in Granada, you can do so by visiting their facebook or e-mailing them directly at reservas@aljibesanmiguel.es.